The Texas Examinations of Educator Standards (TExES) Pedagogy and Responsibilities EC-12 is an exam used to assess your requisite skills and knowledge as an entry-level, grades EC-12 teacher in Texas public schools. 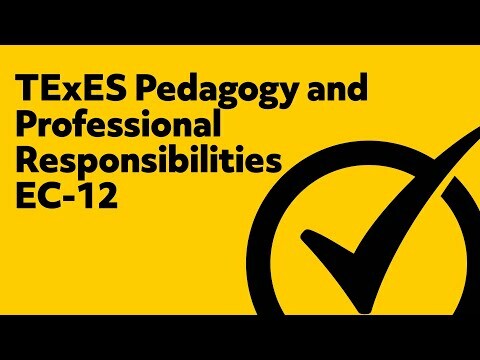 The TExES Pedagogy and Professional Responsibilities EC-12 test is specific to pedagogy and professional responsibilities; meaning, the methods by which you teach and the professional standards to which you adhere as an EC-12 educator. The TExES Pedagogy and Professional Responsibilities EC-12 test is required to earn your PPR EC-12 certificate. How much does the TExES Pedagogy and Professional Responsibilities EC-12 test cost? The TExES Pedagogy and Professional Responsibilities EC-12 exam costs $131. The $131 applies per TExES test. This means that any subsequent TExES test you take (such as any core subjects test) will cost $131. Retakes are permissible; however, you can only retake the test four times after the initial attempt. How do I sign up to take the TExES PPR EC-12 test? Most test-takers will need permission from their educator preparation programs prior to taking the test. So, make sure to check with your educational institution before registering to take the TExES PPR EC-12 test. To take the TExES Pedagogy and Professional Responsibilities EC-12 test, you can register online via the Texas Educator Certification Examination Program website. Test dates for the TExES PPR EC-12 test are continuous. How many questions are on the TExES PPR EC-12 test? The TExES Pedagogy and Professional Responsibilities EC-12 exam is a computer-administered test that consists of 100 multiple-choice, or selected response, questions. Of the 100 questions you will see on the test, 90 questions are scored. The remaining 10 questions are used as pilot-test questions to determine their use in future tests. You will not be able to tell the difference between scored questions and pilot-test questions, so make sure to answer each question to the best of your ability. You will be given approximately 5 hours to complete the TExES PPR EC-12 test. As for scoring, the TExES PPR EC-12 test is scored on a 100-300 scale, and the necessary passing score is 240. What does the TExES PPR EC-12 test cover? PPR standard I: appropriate instructional design, relevant content, appropriate and continuous assessment; includes motivation, as well as understanding of cognitive, emotional, physical, and social development of EC-12 students, among other related topics. PPR standard II: respectful classroom environment, development of rapport, positive learning climate, and excellence and equity; includes understanding different developmental levels, classroom productivity and inclusivity, as well as other related topics. PPR standards I and III, and Technology Applications standards I-V: appropriate instruction reflective of relevant content, responsive instruction and communication, and high-quality feedback; also includes understanding of technology-related terms, data input, search strategies, appropriate technological tools for inquiry, utilizing different communication formats, and knowledge and integration of Technology Applications Texas Essential Knowledge and Skills (TEKS), etc. PPR standard IV: understanding of appropriate roles and responsibilities, ethics, and standards; includes family communication and engagement, understanding diverse backgrounds, parent conferences, and family support resources, among other related topics. Acquiring a more complete understanding of the content, structure, and standards assessed within the TExES Pedagogy and Professional Responsibilities EC-12 exam is your first step toward earning your PPR EC-12 certificate. 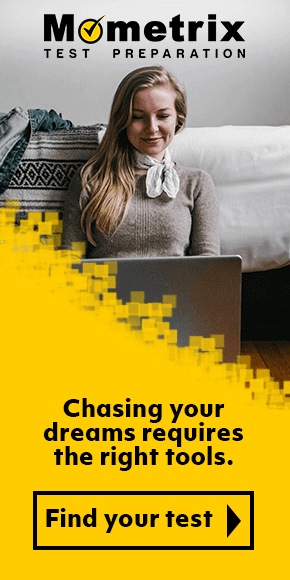 When it comes to taking the exam, there are several steps you can take to ensure your success. Of course, getting enough quality sleep before the exam and taking care of yourself physically will absolutely help you succeed on exam day. However, when it comes to preparing for the TExES PPR EC-12 test, the most effective method of ensuring you do your best on the exam is to prepare using the most comprehensive, best-designed test preparation materials on the market. Mometrix Test Preparation has everything you need in a complete TExES study guide: TExES Secrets. 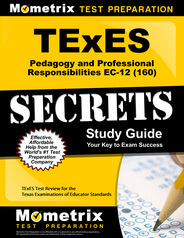 The TExES Secrets study guide was developed by Mometrix Test Preparation’s standardized test researchers. These are experts in the field who have worked tirelessly to unlock the secrets of the TExES PPR EC-12 test and are able to impart to you everything you need to be successful on your first attempt. In this study guide, you get authentic TExES PPR EC-12 practice test questions that will help you recollect knowledge, reduce your stress, and perform your best on the TExES Pedagogy and Professional Responsibilities EC-12 test. Along with the TExES Secrets study guide, Mometrix Test Preparation also offers test-takers like you a set of comprehensive TExES Flashcards, including additional, real TExES Practice Test questions. 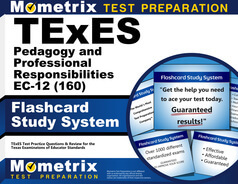 Read the TExES Secrets study guide, evaluate your knowledge and skills with the TExES Flashcards and TExES Practice Test, and earn the score you need to pass the TExES Pedagogy and Professional Responsibilities EC-12 exam the first time you take it. Passing the TExES PPR EC-12 exam the first time you take it will help you earn your PPR EC-12 certificate faster. Stop wasting time; start studying today with Mometrix Test Preparation’s TExES Secrets, TExES Flashcards, and TExES Practice Test. Mometrix Academy is a completely free resource provided by Mometrix Test Preparation. 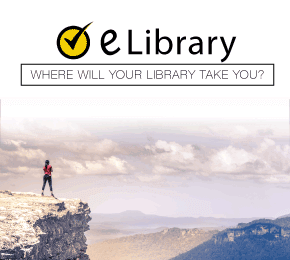 If you find benefit from our efforts here, check out our premium quality TExES Pedagogy and Professional Responsibilities EC-12 study guide to take your studying to the next level. Just click the TExES Pedagogy and Professional Responsibilities EC-12 study guide link below. Your purchase also helps us make even more great, free content for test-takers.